The Indian retail market, which is the fifth largest retail destination globally, has been ranked as the most attractive emerging market for investment in the retail sector by AT Kearney's eighth annual Global Retail Development Index (GRDI) in 2009. The organised retail sector, which presently accounts for only 5 per cent of the Indian retail market, is expected to witness the maximum number of large format malls and branded retail outlets across the country within 2-3 years. And this is not the start, but a step forward when industry giant Bharti Wal-Mart declared to expand its wings in the southern and western parts of India. 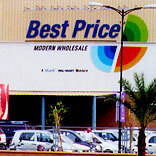 After having 50:50 joint venture with India’s largest mobile service provider Bharti Enterprises, Wal-Mart, one of the world’s largest retailers, had opened their first cash-and-carry store under the brand name ‘Best Price Modern Wholesale’ in Amritsar on May 30, 2009. Albeit, Wal-Mart is popular for its big-box format stores, however, due to the present Government policy guidelines which do not allow the multi-national retailers to set up multi-brand retail stores, the company (Wal-Mart) had no other option instead of introducing cash-and-carry format in India. However, the store while in full operation for over 4 months has been declared to be a big success for the company, considering an ideal example to rethink about its expansion strategy. “We want to be a pan-India company; target to open 12-15 cash-and-carry stores by 2015,” says, Rajan Bharti Mittal VC and MD, Bharti Enterprises. Now the company is almost ready to inaugurate its second cash-and-carry store in Punjab and in this December the store will be in full operation.